Our University of Notre Dame Ireland Colors Flag, Bracket, and Flagpole Kit includes our 3x5 foot NCAA Officially Licensed Flag, Aluminum 6' Flagpole - Heavy Duty, and Aluminum Adjustable Flag Bracket. These are the recommended accessories to fly this 3' x 5' flag. The flag is made of single-ply nylon, is 3x5 feet in size, has four-stitched flyends for extra durability, two metal grommets with sturdy header, and the school athletic insignia, letters, and logos are screen printed. Since this flag is 1-ply, the team logos are a reverse image on the opposite side. 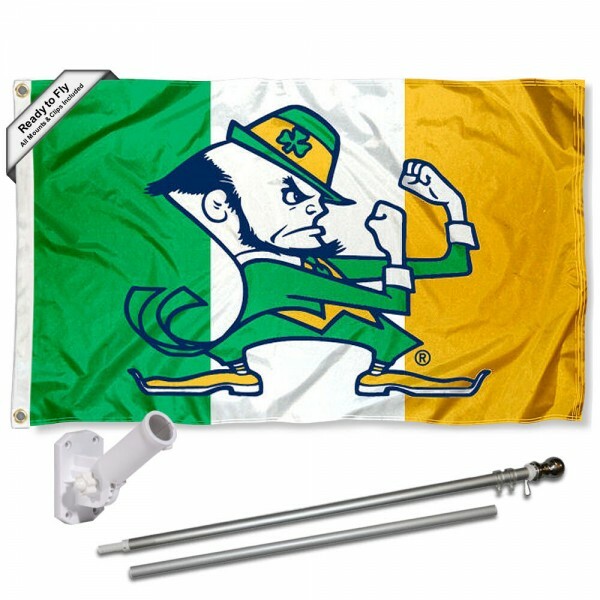 This University of Notre Dame Ireland Colors Flag, Bracket, and Flagpole Kit is a great gift and all hardware is included so It's ready to install and to fly proudly!